How to make French fries in the oven - What's In The Pan? How to make French fries in the oven? I will provide detailed instructions on how to make the best Oven Baked French Fries! These French fries come out crispy on the outside and amazingly tender on the inside. Baked French fries are so easy to make with only a few potatoes, some oil and one pan! I think people love the fries because of MacDonalds. But they just aren’t as familiar with cooking them in the oven. Luckily, it’s an incredibly easy process. By the way, it takes only a few minutes of prep work. And then the fries bake up to crispy tender perfection in a cast iron pan. 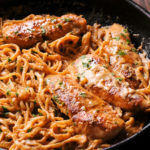 And you can serve them with Parmesan Crusted Chicken or Pan Fried Chicken. Ok, my readers! I get a lot of questions on how to make French fries in the oven. How do I cut French fries? For how long do I cook french fries in the oven and at what temperature? 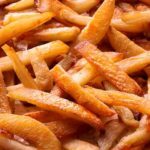 How do I bake French fries, but make sure they turn out crispy on the outside? What kind of potatoes should I use for my baked French fries? And, I am here to answer those questions for you with my favorite baked French fries recipe ever. I used Russet potatoes for this recipe. I find that they produce the best results. However, if you have Yukon potatoes on hand, they work just fine. Cut potatoes into thin strips. Thin strips will prevent French fries form getting too soggy. These fries basically need to be thin to sear right in the oven. 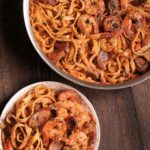 Use a heavy cast iron skillet. 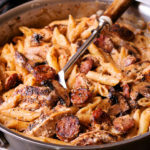 Cast iron retains heat very well. And you need that heat in order to get nice browning on the French fries. You will need to preheat the pan on the stove top on medium heat. For how long? I would say for about 5 minutes to allow the pan to warm up. Next you will add vegetable oil. Personally, I prefer to use olive oil. However, if you have a different vegetable oil in your kitchen, it will work just fine. When you heat the oil, it should look wavy. You should wait about 2 minutes at this point before adding the potatoes. If it’s smokey, then it’s too hot. Once the oil is wavy, you will add your potatoes to the pan. 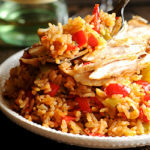 You will want to cook them on the stove top for about 5-6 minutes in order to heat them up. It’s important to keep stirring them to prevent sticking. You should not skip this step. 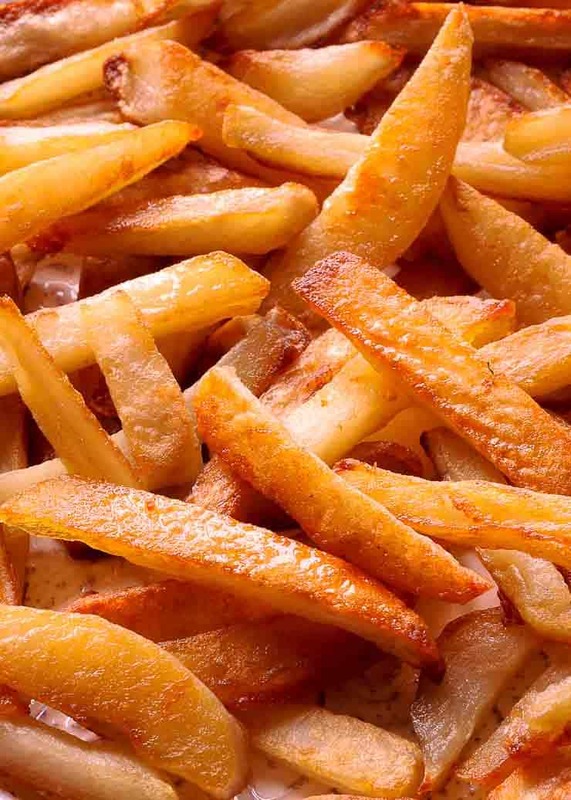 How long and at what temperature should you bake the fries? The total baking time is 30 minutes. At first, you’ll want to bake these at 375 degrees for 15 minutes. Then you would open the oven door and flip them. You will continue baking them for 15 more minutes. Finally, add salt straight into the pan. Stir the French fries in the salt with a fork. You will want to serve them hot. I hope you enjoy this simple oven baked French fries recipe as much as we do! As always, leave me a comment if you have additional questions. I’m happy to answer them! Be sure to follow along on Facebook to see all of the delicious food videos we share! 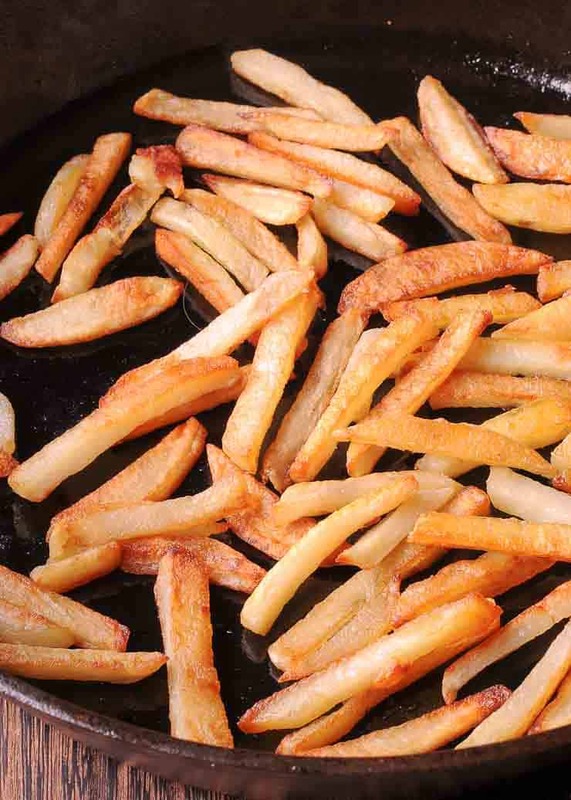 Make healthier fries by baking them instead of frying! Cut potatoes into thin strips. Now let's preheat the oven proof pan the stove top BEFORE putting it in the oven. Turn on medium heat and preheat the pan for a total of 4-5 minutes. Next add oil. It will heat up and look wavy. If it's too smokey, then it's too hot. Once oil is wavy, add potatoes to the pan and cook, stirring for about 4-6 minutes. You should be stirring them often so that the don't get stuck to the bottom. Move the pan with potatoes to the oven and bake them for a total of 30 minutes. But flip them over once. To do that, set a timer for 15 minutes. At 15 minute mark, you would open the oven door and flip the potatoes with a spatula. You will then continue baking them for 15 more minutes until the potatoes are browned and crispy. Remove the pan from the oven add salt straight into the pan. Stir the French fries in the salt and garlic powder with a fork. That’s how I make my French fries too.